Coyoty eats Japanese rose candy. Japanese rose candy, a photo by Coyoty on Flickr. 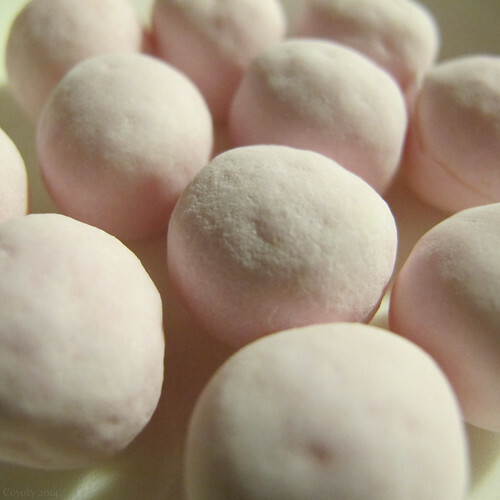 "Fuwarinka Rose Soft Beauty" chewy rose-flavored candy from Japan, purchased from Jappy11 on eBay. Made by Kracie. These are marble-sized candies with chewy soft centers and powdery candy shells. The flavor is a bit perfumy at first, then tart and sweet. The package says, "Makes you comfortable with scent of rose." I don't know about comfortable, but they are quite tasty. I'll be buying more. Not rice. It's like an after-dinner mint covering a candy shell covering a jelly slice center, all rose flavored.